while home buyer activity remains below historical averages. 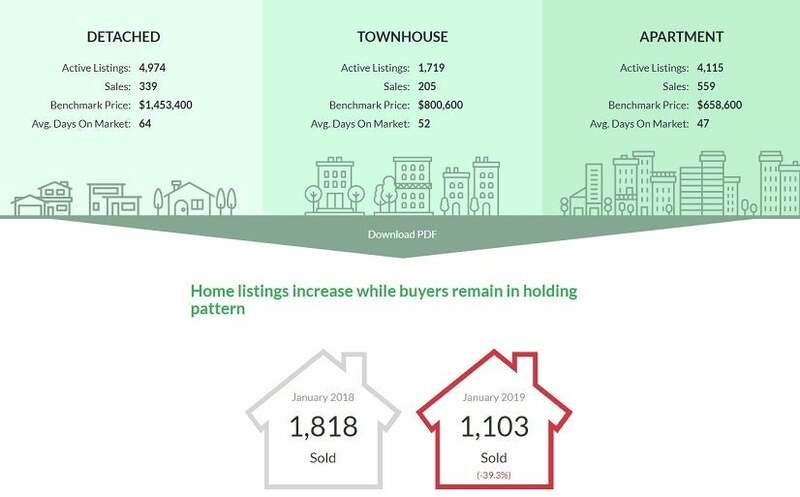 January 2018, and a 2.9 per cent increase from the 1,072 homes sold in December 2018.
lowest January-sales total since 2009.
compared to the 1,407 homes listed in December 2018.
compared to December 2018 (10,275). 13.6 per cent for condominiums. and a 7.2 per cent decrease over the past six months. “Economic fundamentals underpinning our market for home buyers and sellers remain strong. decrease over the past six months. per cent decrease from January 2018, and a 6.2 per cent decrease over the past six months. Richmond, Port Moody, Port Coquitlam, Coquitlam, Pitt Meadows, Maple Ridge, and South Delta. Vancouver totaled $26 billion in 2018.